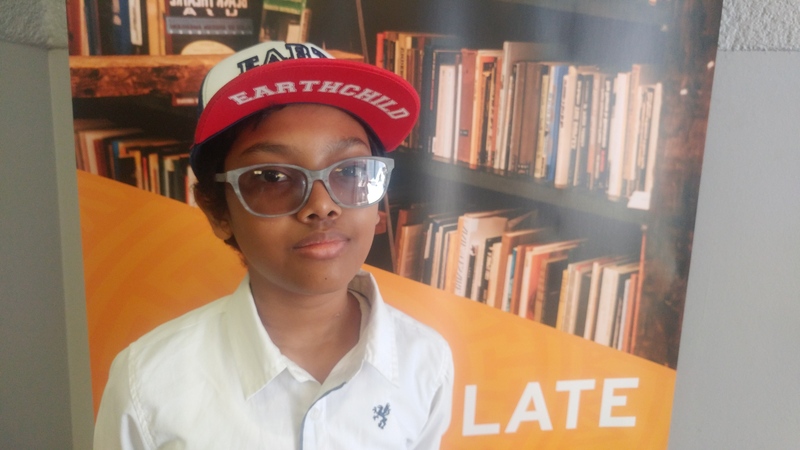 eThekwini Municipality held its third Articulate Africa Book and Art Fair, the flagship Literary and Art Fair for Parks Recreation and Culture Unit that usually bring together highly acclaimed authors. The Daily Vox spoke to Maryam Salie, mother and manager of a 13-year-old published author and game developer, Amr Salie, who shared with the Daily Vox her son’s tough journey as a multi-talented child writer who hasn’t gotten any recognition. We flew all the way from Cape Town so that I could expose Amr to opportunities and people. He’s young but very talented and smart. Amr has published two books called Blameless and The Moth Files. He doesn’t just write books for children his age but he writes thrillers, which I’m pretty sure he’s the youngest author for this genre. I’m his manager and a mother raising four sons, who are all visually challenged. Among all my kids, Amr is the one whose vision is mostly affected. His sight is within 20 centimetres and can’t see anything beyond that, which is a challenge for me as an unemployed mother who constantly has to take him for check ups. Amr is an amazing writer and an exceptionally talented kid, and I’m not only saying this because I’m his mother, but he has many certifications to back that up. He started coding at the age of 8, he’s into cyber security and game developing, and that is something which can’t be done by many kids. And because of his vision, he does online schooling with Think Digital College. Marketing his work has been extremely hard because we can’t find a publisher who understands him for who he is. We only find people who dictate to him how he should be, and that doesn’t work for me because I don’t want him to lose his passion for writing just because someone fails to understand him or to articulate whatever he is doing. Amr doesn’t write children novel but he writes about everyday issues, people need to understand what it takes to write about mental disorder at 10 years old, to even understand what schizophrenia, bipolar, and emotional abuse is at that age. I have been struggling with publishing because not even the government is doing anything to inspire and encourage him. Why can’t the government buy copies of his books and distribute them in libraries? Our government failing our kids. I want to understand how come everyone is getting prizes and awards but we have a dedicated 13-year-old who writes a book and only has 20 centimetre or less vision, but no one recognises his talent. I have had to turn away media at times because what’s the point of them writing about him and getting their numbers skyrocketing while no one is assisting? Does anyone ever ask him how he feels or if he wants to continue writing? He needs motivation too, he needs recognition too and I try by all means to motivate him. There is no support for my child, there is no recognition aside media reports which hardly ever change anything. The only time Amr gets recognition is when events like this happen, where he is called to come and be a speaker and inspire other children but nobody inspires him for his talent. I do all I can for him but with no sponsorship it is really hard. For someone with his talents at this age, one would expect big corporate companies to come forward and sponsor or work with him but none. All we ever get is small sponsorships and as a parent I feel failed and my child also failed by the South African government. I also ask myself at times if I’m failing my son and it’s draining, we really need the support.